A study by NASA, based on extensive satellite imagery and published in the journal Nature Sustainability, has revealed that the two countries with the world’s biggest populations are also responsible for the largest increase in green foliage. Since the turn of the new millennium, the planet’s green leaf area has increased by 5%, or over two million square miles. 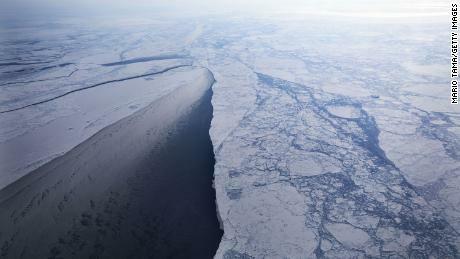 That’s an area equivalent to the sum total of the Amazon rainforests, NASA says. But researchers stressed that the new greenery does not neutralize deforestation and its negative impacts on ecosystems elsewhere. Between 2000 and 2017, a NASA sensor known as the Moderate Resolution Imaging Spectroradiometer (MODIS) gathered high-resolution data of the Earth’s surface from aboard two satellites, the Terra and the Aqua. 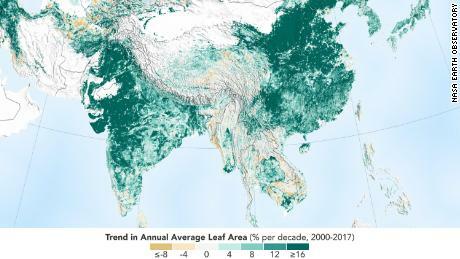 Using the MODIS data, researchers discovered that China is the source of a quarter of the increase in green leaf area, despite possessing only 6.6% of the world’s vegetated area. 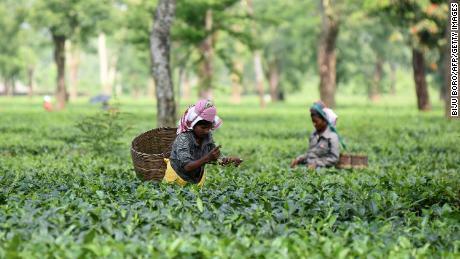 Forests account for 42% of that increase, while croplands make up a further 32%. China’s increase in forest area is the result of forest conservation and expansion programs, NASA said, established to combat the impacts of climate change, air pollution and soil erosion. Both countries have engineered a significant increase in food production, thanks to “multiple cropping practices,” which see fields replanted and crops harvested multiple times each year. “Production of grains, vegetables, fruits and more have increased by about 35-40% since 2000 to feed their large populations,” NASA said. The researchers emphasized however that this phenomenon does not make up for negative impacts on environmental ecosystems elsewhere. “The gain in greenness, which mostly occurred in the Northern temperate and high latitudes, does not offset the damage from loss of leaf area in tropical natural vegetation,” the study authors wrote, citing depleted areas in the Democratic Republic of the Congo, Brazil and Indonesia. Thomas Pugh, an associate professor at the University of Birmingham’s School of Geography, Earth and Environmental Sciences, said the NASA report expands scientists’ understanding of the causes behind global greening. Previously, Pugh told CNN, the increase in green vegetation over the past two decades was attributed to higher levels of atmospheric CO2.